The fourth Jack Ryan movie, The Sum of All Fears was released in 2002, a time when its plot of a nuclear bomb being exploded in an American city by terrorists really didn’t seem all that fanciful. Ben Affleck was hardly a popular choice to take over from Harrison Ford as Tom Clancy’s hero, but otherwise I thought the film was an excellent thriller maintaining the surprisingly high standards for the series (though it’s obviously set in a different filmic universe from its predecessors). 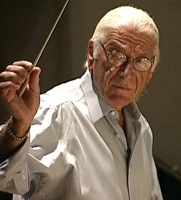 The legendary Jerry Goldsmith was nearing the end of his career at the time – we didn’t know it then of course, but only Star Trek Nemesis, the rejected Timeline and finally Looney Tunes: Back in Action lay ahead – and this was approximately the 750th action thriller he had scored during his glorious career. One might have assumed, therefore, that we would just hear more of the same; and indeed the 2002 version of me rather curiously claimed that was the case in my review of the original album at the time. But now, over a decade on, we get chance to reappraise the score thanks to its expanded release from La-La Land Records. The arresting opening track “The Mission” was something completely fresh from the veteran composer, proving he still had it in him to explore new territory; his gorgeous main theme is performed by soprano Shana Blake Hill (with Latin lyrics), a choir and the orchestra and it’s an absolute beauty, grand and portentous and hugely impressive. The melody – which serves as the main theme, though isn’t heard that frequently through the body of the score itself, also serves as the basis for a pop song version, “If We Could Remember”, performed by Yolanda Adams, which obviously isn’t nearly so grand; but it’s a nice song (and a real rarity from Goldsmith – you’d have to go a long way back through his filmography to find the previous time he contributed an original song to a film). The bulk of the score is more of the “standard” Goldsmith thriller sound which was well-established by that point, which I suppose makes the younger me’s comments a little more understandable; there’s a faintly Middle Eastern-sounding motif not unlike one used in Executive Decision, trombones are used frequently to signal messages of impending doom, and of course there are some terrific action tracks with frantic strings, ballsy brass, pounding percussion. Less expected is a wonderful Russian-flavoured theme – it’s heard in “Thanks a Lot” and “Not the Russians” but sadly the film didn’t give the composer the chance to do quite as much with it as this great Jerry Goldsmith fan might have wanted. One of the things that made me such a fan was his ability to create distinctive sound worlds for his films – of course there’s a great stylistic continuity between projects because of his skill as a composer, but you wouldn’t listen to this and at any time think you were listening to US Marshals or The Last Castle, say. There is a real sense of grandeur to much of it (the choir is heard surprisingly frequently), lending a feeling of importance that makes the film considerably more gripping, “That Went Well” being a prime example. But it’s not all grandeur – heard at times too is a sparser, harsher action sound (such as in the previously-unreleased “The Reservoir / Night Landing / Deserted Lab”) that offers a great reminder of some of the composer’s action classics of the 1970s, with the addition of unmistakably late-period Goldsmith synths. The brief “Clear the Stadium” is perhaps the action highlight, a spectacular piece filled with terrific energy that is just another exhibit to support the claim that this composer was peerless when it came to such things. Later in the score there are several more highlights. “Real Time” is a frantic suspense/action piece with hints of things to come in Goldsmith’s final Star Trek outing; there is a great urgency to “Snap Count” now leading nicely into the previously-unreleased pairing of “Maximum Readiness / Get a Doctor” that works very well. The lengthy “How Close?” sees the composer finally resolve the tension, various ideas playing out before the main theme is finally heard as Ryan is reunited with his lover; and that theme then gets the trademark Goldsmith grand finale treatment in “The Same Air”. To be honest the highlights were all on the original soundtrack album release, but as is often the case with Goldsmith score expansions, La-La Land’s new album allows the music to breathe a little more and showcases additional development of the surprising number of themes in the score. Many of the previously-unreleased cues are very short and therefore combined (sometimes frustratingly combined with lengthier standalone pieces that were previously released separately) but that’s a minor issue. The sound mix is notably different on this album and I think it works well; Jeff Bond’s liner notes include interesting interview snippets with director Phil Alden Robinson, lyricist Paul Williams and Goldsmith’s agent Richard Kraft. The Sum of All Fears is not a great Jerry Goldsmith score (the bar is so high), but it’s flat-out entertaining and even in more “standard” mode he could easily outshine virtually anyone else writing film music at the time. Why have I not seen anyone comment on the fact that the choir parts on “The Bomb” have changed from real to synthetic on the LLL release? One of Goldsmith’s greatest scores. I love LLL’s expanded release. Especially the previously unreleased cues Thanks a Lot, The Reservoir/Night Landing, Clear the Stadium (film version)/Not The Russians/Man Your Aircraft, Supplies/To the Docks, Maxium Readiness/Get A Doctor. The guy still had in his later years.